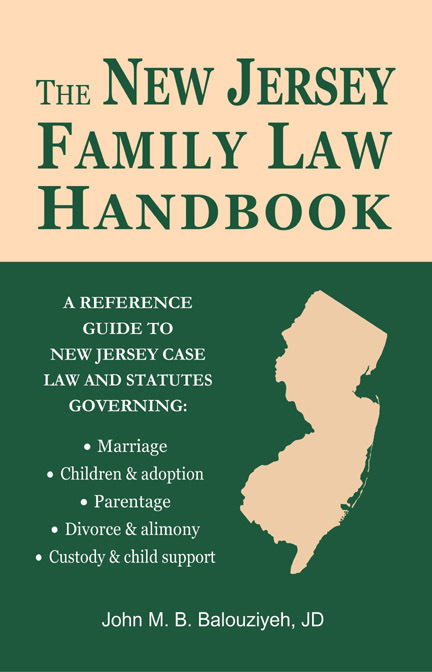 "This Handbook sheds clarity on New Jersey family law for lawyers and non-lawyers alike. It is a must-have on the bookshelf of any person involved in a New Jersey family law matter." Family law, perhaps more than any other area of the law, in many ways affects our daily lives. Whether it is children and adoption, marriage and marital agreements, or the family and parentage, almost all of us will in some way come into contact with family law. • Children, custody, and visitation. This much needed Handbook serves the people of New Jersey by building their confidence in making informed decisions and navigating the legal system, while simultaneously providing legal professionals and law students a thorough introduction to New Jersey family law. Why a Book on New Jersey Family Law? While publications laying out the legal framework of the family exist in other states, such texts in New Jersey are limited to scholarly treatises designed for academics or legal practitioners. No book lays out New Jersey family law in a clear, concise text that is easily accessible to the non-lawyer. This book now fills that void, providing New Jersey residents with a clear, concise summary of New Jersey family law. The main objective of this book is to serve the people of New Jersey by building their confidence in navigating and understanding the New Jersey legal system to make informed decisions. This book seeks to supply information on the state of the law in New Jersey and on the rights of New Jerseyans and to provide a reliable overview of the leading cases and principal statutes that shape New Jersey family law. Although this book cannot replace legal advice tailored to individual needs, it will enable readers to enter legal consultations with more knowledge and familiarity of their legal options and thus more confidence. It may also show readers when they may resolve conflicts on their own and when they should hire an attorney. This book will further help students and practitioners as a quick reference on a particular point of law or as a starting point for further research. Anderson v. Anderson, 122 N.J. Super. 285 (N.J. Super. Ct. 1973); Atha v. Atha, 121 A. 301 (N.J. Ch. 1923); Ayotte v. Planned Parenthood of Northern New England, 126 S.Ct. 961 (2006); Boddie v. Connecticut, 401 U.S. 371 (1971); Bowers v. Hardwick, 478 U.S. 186 (1986); Carey v. Carey, 4 N.J. Misc. 1, 131 A. 103 (N.J. Ch. 1925); Coney v. Coney, 207 N.J. Super. 63, 503 A.2d 912 (Ch. Div. 1985); Davis v. Davis, 184 N.J. Super. 430 (App. Div. 1982); Dilger v. Dilger, 242 N.J. Super. 380 (Ch. Div. 1990); DiTolvo v. DiTolvo, 131 N.J. Super. 72 (App. Div. 1974); Doe v. Bolton, 410 U.S. 179 (1973); Eisenstadt v. Baird, 405 U.S. 438 (1972); Fantony v. Fantony, 21 N.J. 525, 122 A.2d 593 (1956); Gayet v. Gayet, 92 N.J. 149 (1983); Gershon v. Regency Diving Ctr., Inc., 845 A.2d 720 (N.J. Super. 2004); Gilbert v. Gilbert, 66 N.J. Super. 246 (App. Div. 1961); Griswold v. Connecticut, 381 U.S. 149 (1965); Heinl v. Heinl, 287 N.J. Super. 337 (App. Div. 1996); Hewit v. Hewitt, 394 N.E. 2d 1204 (Il. 1979); Hoy v. Willis, 165 N.J. Super. 265 (App. Div. 1978); In re Adoption of a Child by J.M.G., 632 A.2d 550, 553 (N.J. Super. Ct. Ch. Div. 1993); In Re Adoption of Two Children by H.N.R., 285 N.J. Super. 1, 666 A.2d 535 (App. Div. 1995); In re Guardianship of J.C., 129 N.J. 1, 608 A.2d 1312 (N.J. 1992); In re Marriage of Smith, 86 Ill. 2d 518, 427 N.E.2d 1239 (Ill. 1981); Isserman v. Isserman, 11 N.J. 106 (1952); J.B. v. M.B., 783 A.2d 707 (N.J. 2001); Jacobson v. Jacobson, 146 N.J. Super. 491 (Ch. Div. 1976); Johnson v. Johnson, 80 A. 119 (N.J. Ch. 1911); Kinsella v. Kinsella, 696 A.2d 556 (N.J. 1997); Kram v. Kram, 94 N.J. Super. 539 (Ch. Div. 1967); Landwehr v. Landwehr, 111 N.J. 491 (1988); Lawrence v. Texas, 123 S.Ct. 2472 (2003); Lepis v. Lepis, 83 N.J. 139 (1980); Lewis v. Harris, 2006 N.J. Lexis 1521 (N.J. 2006); Loving v. Virginia, 388 U.S. 1 (1967); M.F. v. N.H., 252 N.J.Super. 420, 599 A.2d 1297 (N.J. App. Div. 1991); Mahoney v. Mahoney, 453 A.2d 527 (N.J. 1982); Mani v. Mani, 183 N.J. 70 (2005); Marvin v. Marvin, 557 P.2d 106 (Ca. 1976); Matter of Baby M, 537 A.2d 1227 (N.J. 1988); Matter of Guardianship of R.O.M.C., 243 N.J. Super. 631, 581 A.2d 113 (App. Div. 1990); Maynard v. Hill, 125 U.S. 190 (1888); McChesney v. McChesney, 91 N.J. Super. 523 (N.J. Super. Ct. 1966); Meyer v. Nebraska, 262 U.S. 390 (1923); Michael H. v. Gerald D., 491 U.S. 110 (1989); Moriarty v. Bradt, 177 N.J. 84, 827 A.2d 203 (2003); O'Brien v. O'Brien, 498 N.Y.S. 743 (1985); Orr v. Orr, 440 U.S. 268 (1979); Palmore v. Sidoti, 466 U.S. 429, 104 S. Ct. 1879 (1984); Parkinson v. J. & S. Tool Co., 313 A.2d 609, 611 (N.J. 1974); Petersen v. Petersen, 85 N.J. 638 (1981); Pierce v. Society of Sisters, 268 U.S. 510 (1925); Planned Parenthood of Central New Jersey v. Farmer, 165 N.J. 609 (2000); Planned Parenthood of Central New Jersey v. Farmer, 220 F.3d 127 (3d Cir. 2000); Planned Parenthood of Central New Jersey v. Verniero, 41 F. Supp. 2d 478 (D.N.J. 1998); Planned Parenthood of Southeastern Pennsylvania v. Casey, 505 U.S. 833 (1992); Prince v. Massachusetts, 321 U.S. 158 (1944); Reynolds v. United States, 98 U.S. 145 (1878); Roe v. Wade, 410 U.S. 113 (1973); Rothman v. Rothman, 65 N.J. 219, 320 A.2d 496 (N.J. 1974); S.B. v. S.J.B., 609 A.2d 124 (N.J. Super. Ct. 1992); S.M. v. S.J., 143 N.J. Super. 379, 384, 363 A.2d 353, 356 (Ch. Div. 1976); Sabbarese v. Sabbarese, 104 N.J. Eq. 600 (Ch. 1929); Santosky v. Kramer, 466 U.S. 429 (1984); Skinner v. Oklahoma, 316 U.S. 535 (1942); Sosna v. Iowa, 419 U.S. 393 (1975); Stenberg v. Carhart, 530 U.S. 914 (2000); Troxel v. Granville, 530 U.S. 57, 120 S. Ct. 2054 (2000); Vacco v. Quill, 173 S.Ct. 2293 (1997); Washington v. Glucksberg, 173 S.Ct. 2258 (1997); Wojnarowicz v. Wojnarowicz, 137 A.2d 618, 620 (N.J. Ch. Div. 1958); Zablocki v. Redhail, 434 U.S. 374 (1978).